I have another quick & easy Christmas card to show you today! I know some peeps definition of quick & easy is no layers or embossing but for me; this card IS quick & easy LOL!!!! I kept my layout very simple, used a bit of shimmer mist--which you really can't see in this pic as it comes out as specks or something on my card--to liven it up a bit & added a sliver of ribbon across one corner with a gorgeous button to finish it off! I hope you enjoy my creation & now I'm off to make my card for the Color Me Beautiful challenge on Friday so make sure you come back to see it! Thanks so much for stopping by & have a great rest of the day! Such a great layout! I love the color palette. That 'lil gem in the upper left corner is perfect! Hello Miss Jackie! You have been making some BEAUTIFUL cards lately! They are all just wonderful! Fabulous card! Love the colors you chose to create it. It's beginning to be that time to start stamping for Christmas. Look at you off to a very lovely start with all these very fabulous cards you have made already. Another awesome Christmas card Jackie!!!. This card will for sure bring some joy to the recipient, beautiful! I love the way you incorporated brown in the card, it is just gorgeous! Very beautiful Christmas card, Jackie! Love the colours you've used and the great background embossing. Gorgeous design! Loving the colors and fabulous layout. Jackie, this is such a wonderful design! 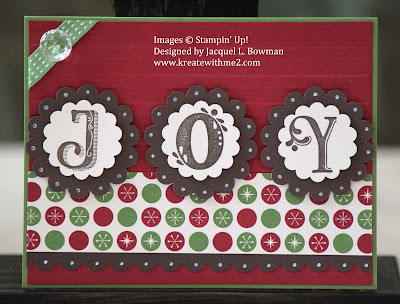 I love the letters stamped in the scallop layers and your colors are wonderful together! I'm looking for a simple but detailed 'step up' card for my club and would love to 'borrow' your design!! This is too cute! You crack me up with your version of clean and simple! I love the font stamp you used for JOY.